I decided that today would be a good day for a Valentine's bento. Mostly because I am afraid I'll forget if I say, no, I'll wait a few days. I really want to pop by the dollar store to see if I can find any cute bento-ish items for Valentine's, but thankfully I do have a plethora of heart related items. 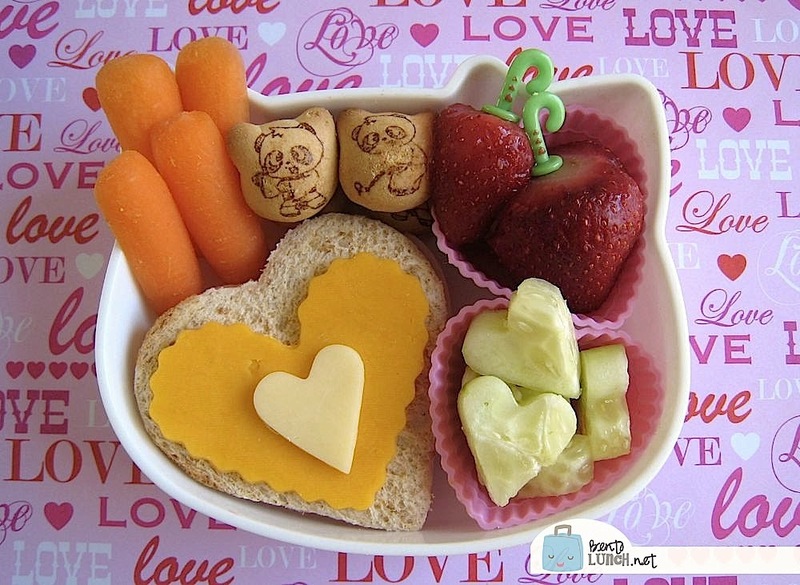 Faith had a heart shaped turkey & cheese sandwich on 7-grain honey bread, topped with white and orange cheddar hearts. To the right, she has heart shaped cucumber pieces (in a heart shaped silicone cup) and some strawberries that I had hoped to make heart shaped. However, said strawberries were frozen and even thawed were a bit messy to shape. So they got a cute pick and dropped in another silicone cup. Above the sandwich, she has some carrot sticks and some strawberry panda cookies. I do have a few Valentine's ideas, just need to pick up some supplies first. I did a hearts bento today too. So sweet and colorful! Cute and colorful bento! Happy Valentine's Day, Shannon. where do you find those panda cookies? or what brand are they? this is very cute!